The commercially built Bigelow Expandable Activity Module, an inflatable room on the International Space Station, is seen as inflation work began on May 26, 2016. NASA ultimate called off the inflation attempt when it did not go as planned. NASA called off attempts to inflate the first privately built expandable room on the International Space Station (ISS) today (May 26) after early efforts to pump up the module didn't go exactly as planned. The inflatable room, called the Bigelow Expandable Activity Module (BEAM), is an experimental habitat built by the company Bigelow Aerospace. NASA wants to study the technology for future deep-space habitats, while Bigelow Aerospace has its sights set on private space stations and moon bases. But when NASA astronaut Jeff Williams began the inflation process for BEAM on the ISS early this morning, the module did not expand as expected, forcing flight controllers to call off the attempt for today. 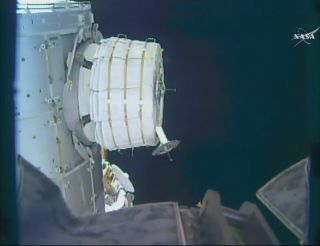 You can see video of the BEAM module inflation attempt here, courtesy of NASA. During today's inflation attempts, Williams manually let air inside the BEAM module via a small valve in 1- to 4-second intervals. At first, the module appeared to expand about 5 inches (12.7 centimeters), but then stalled. Mission Control opted to stand down for the day to analyze the situation, and Williams said he'd be ready for the next try. "This are the kinds of things [where] the team is up for the challenge," Williams radioed down to Mission Control. "It's space business." When packed, the BEAM module is a compressed cylinder just over 7 feet long (2.16 meters) and nearly 8 feet wide (2.36 m). But once fully inflated, BEAM will be over 13 feet long (4 m) and 10.5 feet wide (3.2 m), essentially a new room with 565 cubic feet (16 cubic m) of space. NASA and Bigelow Aerospace plan to study the inflated BEAM module over the next two years to gauge its effectiveness as a space habitat. An artist's depiction of how the inflatable Bigelow Expandable Activity Module (BEAM) built by Bigelow Aerospace will look after it is fully deployed on the International Space Station. BEAM launched to the space station on a SpaceX Dragon cargo ship on April 8 and arrived two days later. On April 16, the uninflated module was installed on the space station's Tranquility node. The Las Vegas-based Bigelow Aerospace is no stranger to expandable habitats. The company has launched two unmanned, inflatable habitat prototypes (called Genesis I and Genesis II) into orbit, in 2006 and 2007, respectively. Bigelow Aerospace is also developing a larger space habitat, called the B330, which is designed to offer astronauts a whopping 11,650 cubic feet (330 cubic m) of space and serve as the foundation for a commercial space station or manned base on the moon or Mars.